GReads! 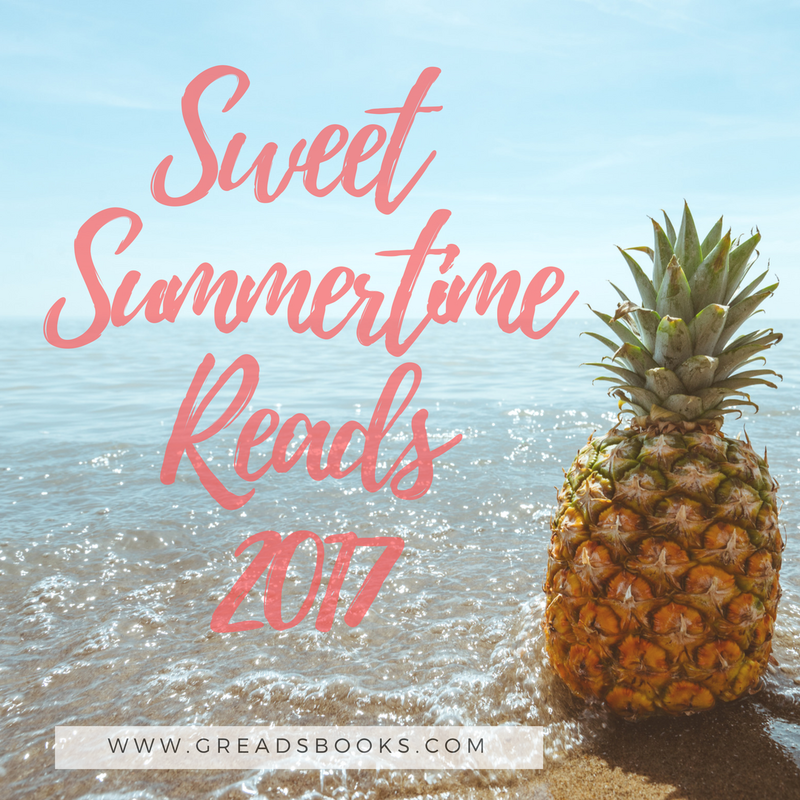 : Sweet Summertime Reads with Cards by Andrea S.
Sweet Summertime Reads with Cards by Andrea S.
This week's Sweet Summertime Reads is featuring one of my dearest (and most favorite!) friends, Andi. Some of you may know her as @andiABCs from twitter, or from her blog which may be found here: https://andiabcs.com/. 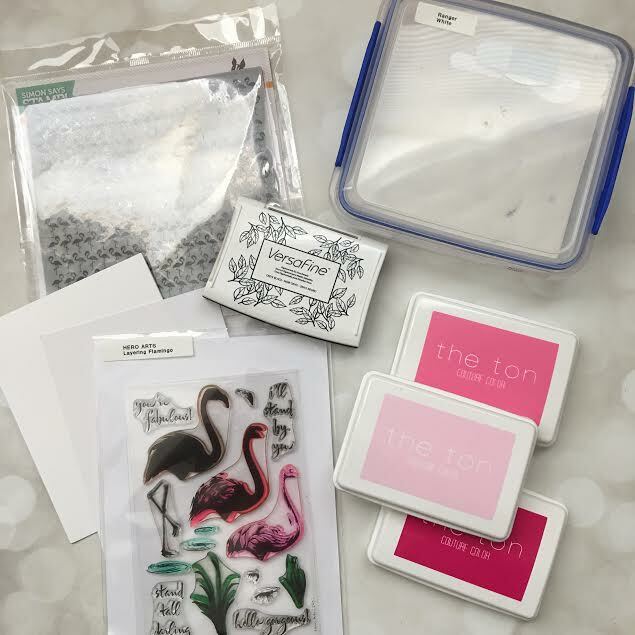 She's an avid reader like myself, but she's also taken up crafting and creating cards. Her crafty talents speak for themselves! 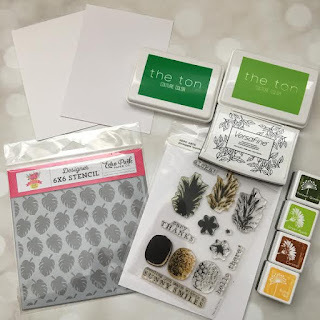 I thought it would be fun for my readers to check out her stuff and also to enter to win some of those amazing cards she's handmade. Wow, my 4th time being invited to do Ginger's fun feature, Sweet Summertime Reads! In my past 3 guest posts my posts were all book related and talked about books I was reading over the summer, books you should read over the summer or connecting books to locations in Boston. Today we are doing something different. 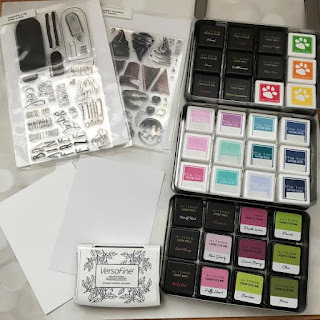 Today I am showing you the new side of me, my crafty side. If you are a reader of my blog or follow me on Twitter/Instagram, you may know I have become a card maker. About a year and a half ago I got into paper crafts and played around with making a lot of different things. It took about 6 months but I figured out what my niche is in the craft world and it is card making. 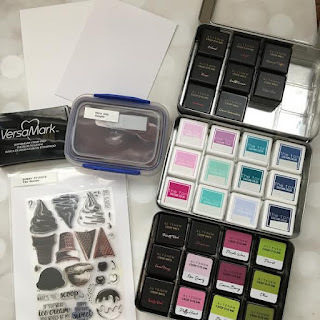 In the last year + my card making style has changed and evolved but my love of it hasn't. In fact I recently opened my own Etsy shop where you can purchase my handmade cards: Cards by Andrea S..
What does this all have to do with my post for Ginger's blog? Well G asked me to show off my card making skills and make some fun summer themed cards. And the best part, all 4 of these cards can be yours by entering the giveaway below. 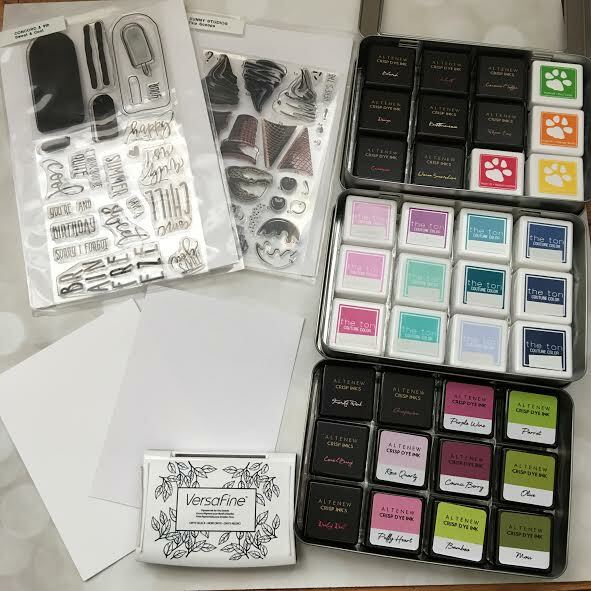 So without further ado, the cards and supplies I used to make them. I am a flamingo fanatic. If you know me, you know this about me. I just love everything that has them on it so making a flamingo card was the first thing I did. 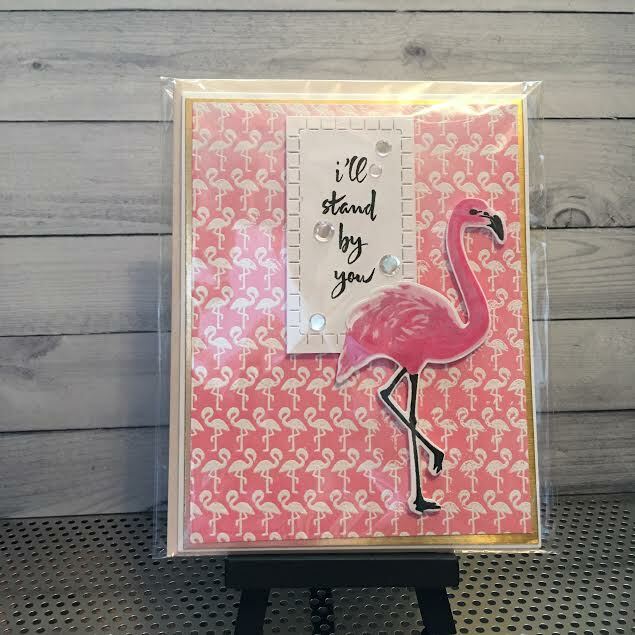 To be honest I wanted this card to be in your face flamingo so I went with it. I took a piece of white card stock and cut it to 5 1/2 x 4 1/4 (standard A2 size card base). Then I took my flamingo background stamp and used VersaMark ink (a clear sticky ink) and stamped the flamingo pattern down. When that was done I used white embossing powder to cover the panel and used my heat tool to melt the powder. After it was cooled I grabbed my Worn Lipstick Distress Oxide ink and blended it over the stamped panel. Grabbing my Hero Arts layering Flamingo stamp i created a die cut flamingo using some pink inks from The Ton. Then I die cut a rectangle and stamped the sentiment. I attached all of the components to the card panel which I attached to a piece of black card stock before gluing everything on to a card base and added some sequins for sparkle. For the popsicle card I went a little outside of the box. Basically I took the same card panel size as above and trimmed it to be 5 1/4 x 4. 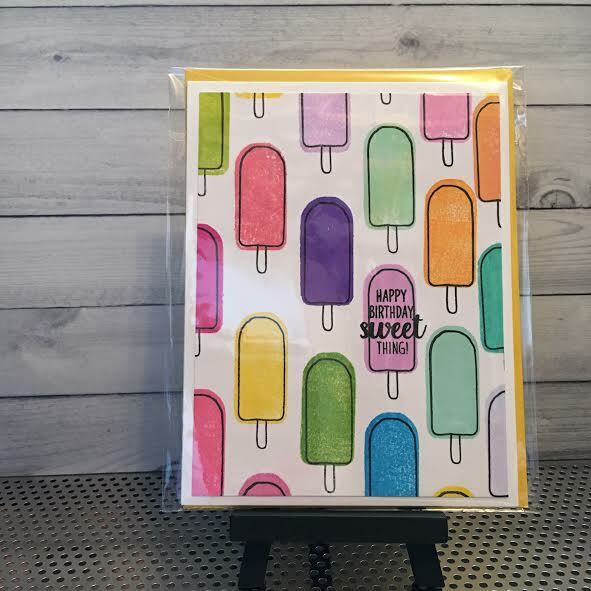 I then used my popsicle outline and stick outline stamps by Concord & 9th and created a background by stamping randomly in order on the panel. When all the outlines were done I used the backside of the popsicle fill in stamp to make the image bigger than the outline. I used a variety of inks from The Ton, Altenew and Simon Says Stamp for this process. I finished off the card with a sentiment from Sunny Studios and attached the panel to a card base. When I saw the palm leaf stencil I knew I was going to use it with the pineapple stamp and die set I owned. I took the stencil and taped it over a 5 1/4 x 4 card panel. Using to green inks from The Ton I blending the colors on in a randomish looking pattern. Because the panel was so bold I used a piece of vellum to soften to the look. 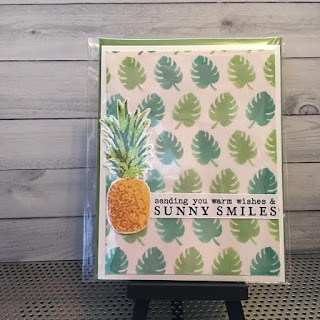 Similar to the flamingo card, I grabbed my Pineapple layering stamp and die from Hero Arts and stamped out a fine pineapple. 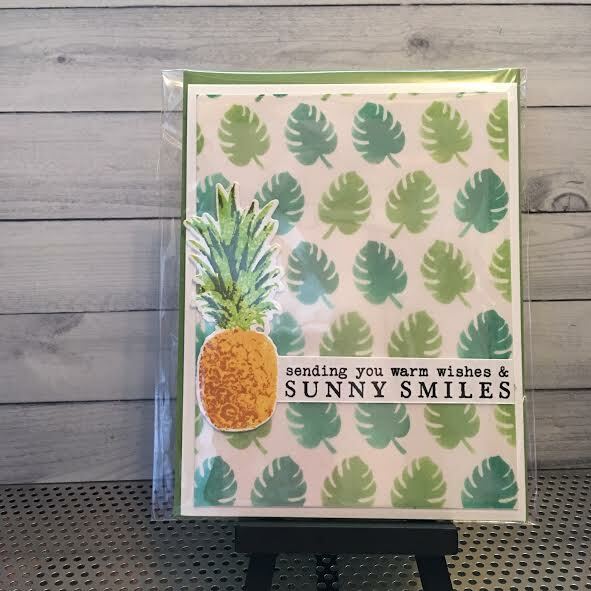 I used the large sentiment from the set and attached it like a banner to the pineapple and the attached them both to the panel. When the panel was complete I adhered it to a A2 size card base. For this card I was inspired by a card I saw on line. 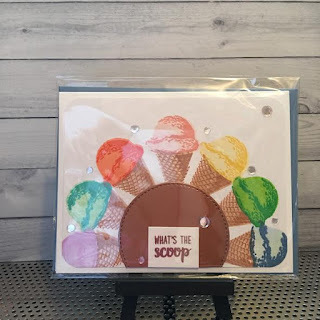 I took my Sunny Studios Ice Cream layering set and used the sugar cone and ice cream scoop stamps. Before I did my stamping though I traced a circle on to my card panel. Using the circle as a guide I stamped out the ice cream cones and then the scoops. I used inks from The Ton, Altenew, and Hero Arts to create the color dimensions on the ice creams. After I had the ice creams done I die cut a circle out of copper card stock and adhered it to my panel over the traced lines. Then I used a sentiment from the stamp set and heat embossed it with copper embossing powder and attached the rectangle to my panel. I attached the panel to a card base and added some sequins for some sparkle. And there you have it, a brief description on how I made all 4 of my summer themed cards. A huge thanks goes out to Ginger for inviting me to show my crafty side to all of you. She knows how much I love making a good card and she allowed me free reign with these. Make sure you check out the giveaway below and all the other fantastic giveaways. Thanks again G for having me for the 4th time! Here's your chance to win all 4 of these fantastic cards made by Andi! This giveaway is open to US residents only. Fill out the form below to be entered -- good luck!! I love Andi's cards! She is the best. As for my crafty talent, I make bookmarks, jewelry & paper flowers. These are so awesome! I love sending and getting cards. I'm not super crafty; but I really enjoy scrapbooking by making SMASH books. SMASH books are one of the things I could spend months working on...in fact I have. I also love writing, which is creating something. These are gorgeous! I love the idea of being crafty, but I tend to start a lot of projects and never finish them. I really want to work on my knitting more... but summer just doesn't feel like the right time for it. I'm not really good at crafts, but last week I went to a paint party. We painted door signs. It twas fun and I did okay. I absolutely love Andi's cards. They're adorable! I do have a couple crazy talents. I can sew. I make my own book sleeves, pillows, seat cushions, etc. I can make bracelets from string and beads. I'm sure I have a few others, but if I could have one crafty talent I'd love to be able to make those cards. I am not the best at doing big crafty projects, but little ones with the kids are always fun. I am crafty. I just have to find a project! Not afraid to dive in! I don't know about being crafty, but I like to make props and decorations for birthday parties. I learned alot of different crafts from my mother. I'm trying to pass it on to my girls. Our favorite thing to do is bookmarks. I don't really have any crafty talents, but I would love to be able to knit! I like to see what I can make from pinterest! I actually have a very crafty family! I am a full time seemstress at a local upholstery shop. We make everything from boat seats, to furniture and car upholstery. I don't think I'm particularly talented at anything, it doesn't stop me from crafting and enjoying it anyway. I don't think I'm particularly talented at anything. That doesn't mean I don't enjoy trying. I like to try and get crafty by painting. I can knit, crochet and sew a little.